The topic of frugal innovation is increasingly gaining relevance in social as well as scholarly discourse. 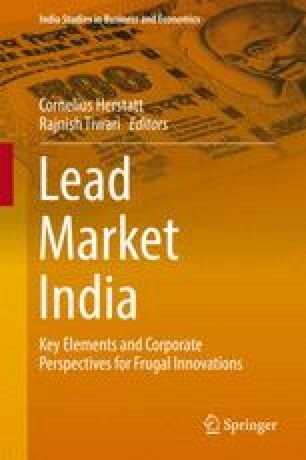 Frugal innovations have been perceived by many to be a phenomenon generally confined to emerging economies where there are large groups of unserved consumers with unmet needs. But there is increasing evidence that this phenomenon is getting relevant also in the industrialized nations potentially affecting the long-term competitiveness of domestic firms not only overseas but also at home. This paper has a twofold objective: (a) It seeks to establish the theoretical antecedents of frugal innovation by examining the scholarly discourse; and (b) It attempts to generate hypotheses about its long-term relevance by examining historical trends of frugality and their disappearance. Based upon an extensive literature review and some preliminary primary data we propose a new working definition for frugal innovation and hypothesize that frugality was a key social value with positive associations before the era of unprecedented prosperity in the industrialized world, which led to saturated markets and inter alia to feature-driven competition and over-consumption of resources. New ground realities, e.g., economic downturn in the industrialized world and the rapidly rising consumption in the economically developing world, are expected to turn frugality, once again, into an important societal value and frugal innovation into a critical success factor in mid-term future. The authors would like to thank Prof. Dr. Cornelius Herstatt (TUHH), Prof. Dr. Thorsten Posselt and Prof. Dr. Tobias Dauth (both Fraunhofer MOEZ) for their valuable feedback. We are grateful to all participants of a workshop held on January 12, 2016 in Hamburg who provided useful research insights. Thanks are also due to Germany’s Federal Ministry of Education and Research (BMBF) for enabling this study. Rajnish Tiwari would like to sincerely thank Claussen Simon Foundation for supporting his research at TUHH with a generous grant.